Equip your business with our suite of cash management services, including ACH systems and wire transfers. Automated Clearing House (ACH) transactions are electronic debits and credits used to efficiently disperse funds or collect receipts through direct payment from any bank account in the United States. ACH Manager is the most cost effective and timely way to move money. Remote Deposit Capture allows business owners to capture electronic images of checks and Magnetic Ink Character Recognition (MICR) information right at their place of operation and send to the bank for deposit through a secure internet connection. Checks are deposited into your account the same day if sent and confirmed before 6:00p.m. CST. Checks received for deposit are subject to the provisions of the Uniform Commercial Code or any applicable collection agreement. All items received are subject to conditions and terms stated in the Mobile Deposit Disclosure and Funds Availability Policy provided on your account. Checks deposited after 6:00 p.m. (CDT) will be processed on the following banking day. Some deposits may not be available for immediate withdrawal. 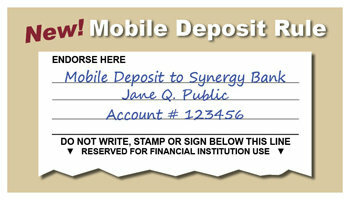 Synergy Bank's Business online wire transfer service is an easy and fast way to send funds electronically. Customers can log into their business online banking and securely wire payments within the US. Positive pay is an automated fraud detection tool that matches the account number, check number and dollar amount of each check presented for payment against a list of checks previously authorized by the customer.